Miche Pistard Wheelset Review: Alloy track wheels for the budget minded. Miche Pistard wheelsets are known for their lightweight design. While not as weightless as some other brands on the market, these wheels are perfect for track use. You can ride on a single track brakeless using these wheels. They are designed impeccably, and can be compared to expensive brands. Miche Pistard is an alloy track set of wheels with signature lightweight medium profile rims and extra large flanges and hubs. It sports the ideal amount of stiffness track racers desire. While the brand is called lightweight, most weights for the wheels average around 2,000 grams. By industry standards, this is rather medium weight. There are definitely other brands like Campag that offer lighter models. Even so, the wheels do feel quite light around this weight. What matters is how they perform on the road. From our experience, these do not weigh one down while on the road. Do note that the wheels require nuts and rim tape, which weighs them down. But there are not sprockets or lock rings adding, even more, weight. The wheelset design is built around really large fanlge hubs. The hubs themselves are very light, smooth and quite sturdy. Most wheelsets of this model come with single sided fixed gear rear hubs. This ensures stability and high performance. Spokes on the front wheels usually are around 24, and back wheels tend to feature more spokes around 32. This differentiated design distributes power efficiently and good balance is ensured. This model uses Italian threads for the rear hub, which is the same used by Campagnolo wheels. The rims are 28mm deep but have no breaking surfaces. So you should only use these wheels for tracks. Don’t equip mountain bikes with these wheels. You can ride on a road brakeless with a fixed gear. 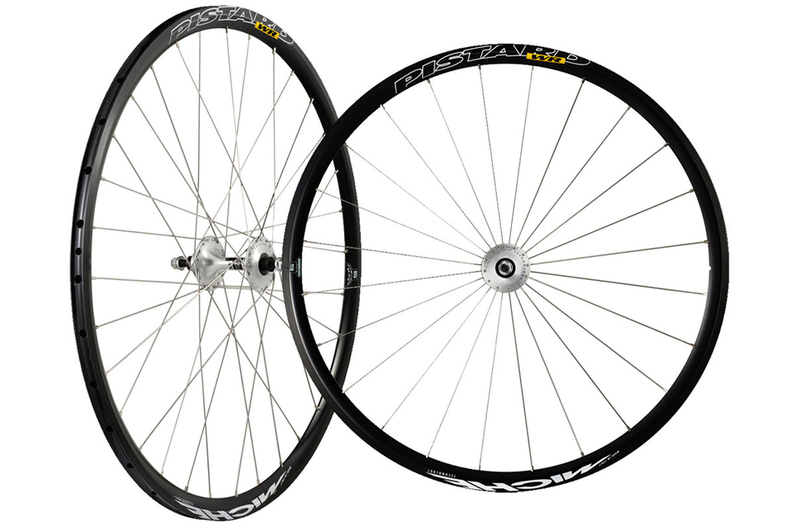 You can purchase these wheels with either a clincher rim or a tubular rim. Miche Pistard is marketed as a lightweight model, but it’s rather medium weight considering other choices on the market. It’s also a fixed gear wheelset. Regardless of these downsides, this is a solid performer when it comes to trailblazing.